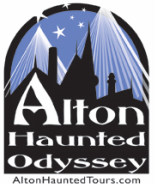 ​haunted tours in Alton, IL. The stroll includes stops at five haunted locations paired with a five-ounce pouring of one of five different Old Bakery brews. ​Reservations for the 2018 tour season are now available!